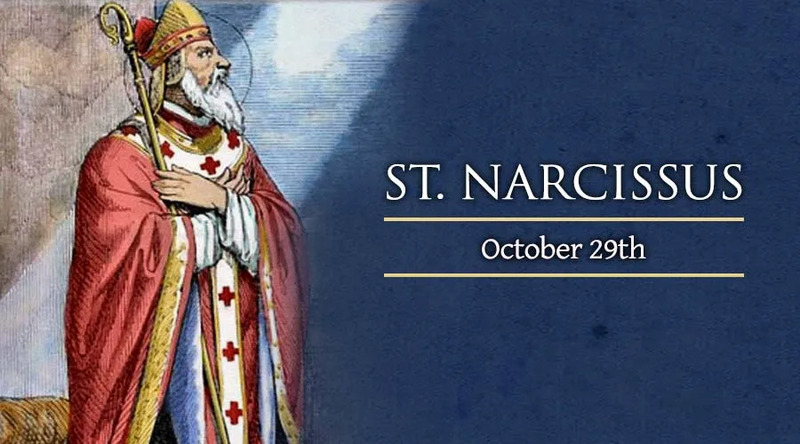 St. Narcissus was born towards the end of the first century, and he was nearly 80 years old when he was named as the 30th bishop of Jerusalem. In 195, he and Theophilus, bishop of Caesarea in Palestine, presided together over a council of the bishops of Palestine held at Caesarea around Easter. There it was decreed that the feast be kept always on a Sunday, and not continually with the Jewish Passover. The bishop and historian Eusebius says the following miracle can be attributed to him: One year on Easter-eve the deacons did not have any oil for the lamps in the church, which was necessary at the solemn divine office on that day. Narcissus ordered those who had care of the lamps to bring him some water from the neighboring wells. This being done, he pronounced a devout prayer over the water. Then he bade them pour it into the lamps; which they did. The water was immediately converted into oil, to the great surprise of all the faithful. Some of this miraculous oil was kept there as a memorial at the time when Eusebius wrote his history. The veneration of all good men for this holy bishop, however, could not shelter him from the malice of the wicked. Three incorrigible sinners, fearing his severity in the observance of ecclesiastical discipline, accused him of a terrible act. The sinners swore that they were right, adding the following to their testimony: One wished that he might perish by fire, another, that he might be struck with a leprosy, and the third, that he might lose his sight, if what they alleged was not the truth. Their accusations were false, however, and soon Divine Retribution called upon them. The first was burnt in his house along with his whole family by an accidental fire in the night, the second was struck with a universal leprosy and the third, terrified by these examples, confessed the conspiracy and slander, and by the abundance of tears which he continually shed for his sins, lost his sight before his death. Narcissus either could not stand the shock of the bold calumny, or perhaps he made it an excuse for leaving Jerusalem in order to spend some time in solitude, which had long been his wish. He spent several years undiscovered in his retreat, where he enjoyed all the happiness and advantage which a close conversation with God can bestow. The neighboring bishops appointed a new pastor for his church until Narcissus returned. Upon his return, the faithful rejoiced and convinced him to once again undertake the administration of the diocese, which he did. As he reached extreme old age, he made St. Alexander his coadjutor. St. Narcissus continued to serve his flock, and even other churches, by his assiduous prayers and his earnest exhortations to unity and concord, as St. Alexander testifies in his letter to the Arsinoites in Egypt, where he says that Narcisus was at that time about one hundred and sixteen years old. The Roman Martyrology honors his memory on October 29th.